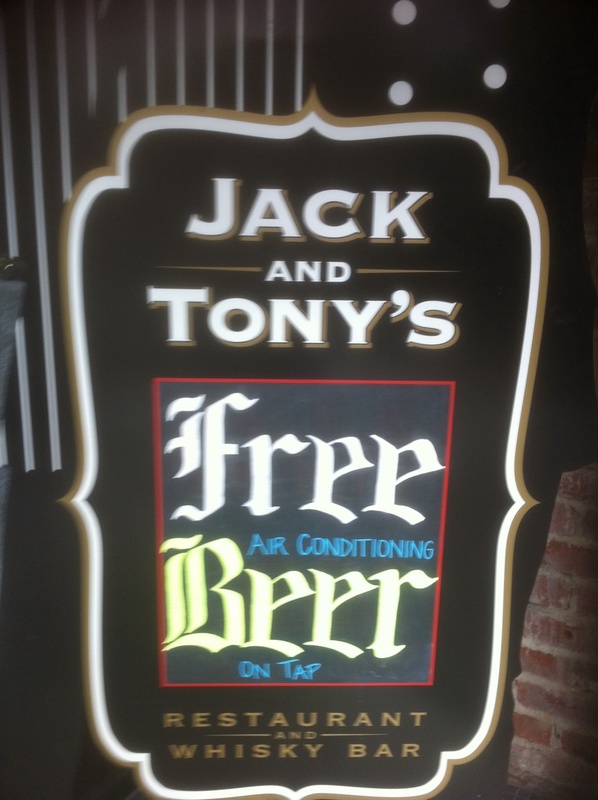 FREE AC AT JACK AND TONY'S ......! With over 350 expressions of Scotch, Bourbon, Irish, American and Japanese whiskies and brandy on the shelves behind the bar, who needs an expensive trip to Ireland, Scotland or even Tennessee? Begin your taste testing right here and don’t forget your designated driver! This place occupies the former “Ristorante Capri” a wonderful old Italian restaurant we used to frequent when we moved to Sonoma County over 10 years ago. Sadly, the owner passed away suddenly, and the site was vacant for a few years. Now, re-opened 2+ years ago as “Jack and Tony’s Restaurant and Whisky Bar”, we were familiar with the old restaurant’s interior and were somewhat surprised by the changes. Not in a bad way, just different. Absolutely no art on any walls. Kinda stark, really. And the bar area was flipped over to the other side of the wall. On to the food. We were shown to a booth (always appreciated) and began a review of the menu. A couple of interesting starters: Deviled Eggs (3); House-cured Salmon Gravlax – Curried Egg Salad Crostini and Baked Brie with Toast and Roasted Nuts, to name a few, and then the usual suspects like Chilled Oysters on the Half-Shell, Garlic Parmesan Fries and Baby Spinach Salad. All of these sounded okay but when the friendly waiter mentioned a chef’s special, Blackened Shrimp with Remoulade Sauce, we opted for that. Good, not great as the shrimp were over-grilled, leaving them a wee bit tough. Main courses ordered: Steamed Mussels with Andouille and Lager and an Andouille Sausage Open-Faced Sandwich with Roasted Red Bell Peppers, Grilled Onion and Stone Ground Mustard. The mussels were plentiful, and not swimming in chucks of tomato; the Andouille sausage was a great accent. In fact, for me, it added more to the dish than the usual red pepper flakes you can find in almost every version of steamed mussels. Unfortunately, the sandwich of Andouille sausage was less appealing. However, the french fries served with the sandwich salvaged the meal. Hand-cut and deep-fried perfectly they were served with a house made catsup that had hints of apple cider, molasses and Tapatio hot sauce. YUMMY. Desert was a Ballantine’s Butterscotch Pudding Parfait with Snickerdoodle Cookie (one way or another, the owner wants to acquaint you with that devil Scotch!) and it was delicious. Definitely not your Mother’s pudding! We will return for dinner sometime and I know a sampling of some of those bottles displayed behind the bar will definitely be in order. I hear they also host a very good happy hour, from 4pm-6pm every day with bar snacks half price!